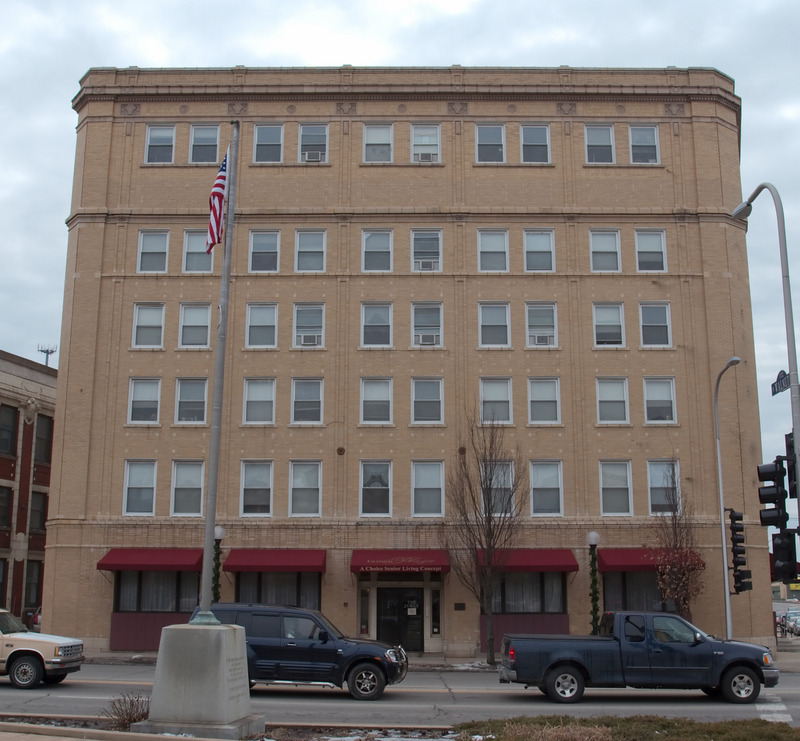 This historic Champaign building was built in 1915 by Spencer and Temple. Though the building was originally built as a hotel, it now serves as an assisted living facility. Designed by Spencer and Temple and built by the well-known English Brothers 1915, Champaign-Urbana's Inman Hotel was situated in the heart of downtown Champaign and was located directly next to the Illinois Traction Railway Station. Its classical revival style of architecture and glazed yellow brick with beige terra cotta trim makes the building quite unique and simple. The Inman Hotel lasted from 1915-1974, and from 1975-1987 it became home to the National Academy of the Arts. Conclusively, from 1991- present, it is now home as a residence for senior citizens. Since the building has become a senior citizens residency, it is now known as the Inman Place. This has become a landmarked building in Champaign-Urbana and it has been on the National Register of Historic Placed since 1989. 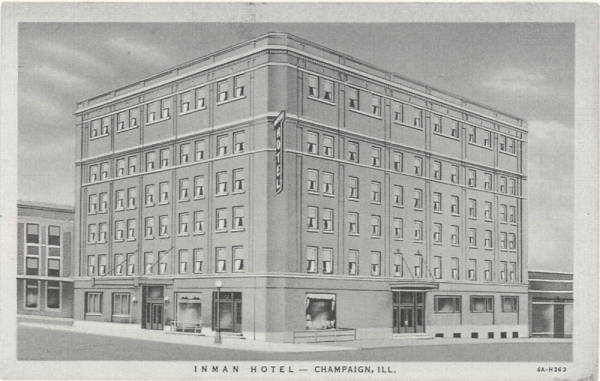 The intentions of the Inman Hotel was to temporarily house guests that came to visit the Champaign-Urbana area. With its six decades of operation as a hotel, it was well known and a great place for visitors to stay. One of its features is Its unique design had a variety of different room options that suited for families of varying size .The design then changed and renovated for actual residency and is now housing for senior citizens since the name changed to Inman Place in 1991. Some other features of this project is that it was initially constructed with only five stories, and the sixth was added a few years later, as you can see from photos. And, lastly, another feature of the Inman place is the shape of the lot is larger on one side than the other making the east wall thirty-two feet longer than the west wall which results in a slight angle. 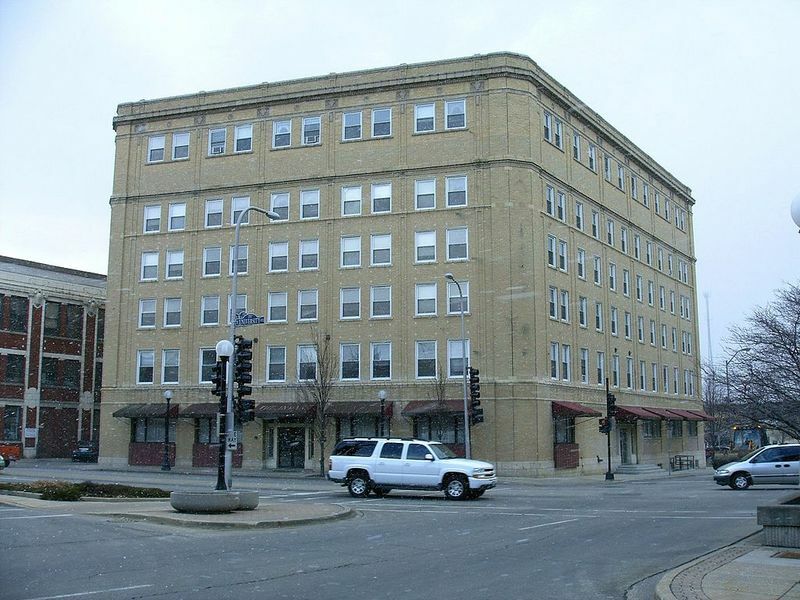 The building type of this project was a hotel that now has turned into an assisted living housing that includes a dining hall, beauty shop, laundry facility, resident storage, and exercise facility. Architects Nelson Strong Spencer and Temple were both active designers in the early 19th century, and they worked primarily in the Champaign-Urbana area. Their most famous cooperation is designing this very building which has been on the National Register of Historic Places since 1989. The builders of the project, the English Brothers Company, constructed it. The English Brothers Company was founded in 1902 by Richard C. and Edward H. English, both of which attended the University of Illinois at Urbana-Champaign. The company constructed many significant buildings on campus such as Foellinger, David Kinley Hall and Memorial Stadium. Kenny Gym (Urbana): A two-story building connected to the Kenny Gym Annex, built in 1902. Designed by Nelson Strong Spencer. Noyes Laboratory of Chemistry (Urbana) - a.k.a The William Albert Noyes Laboratory of Chemistry, was built in 1902 as the "New Chemical Laboratory". Designed by Nelson Strong Spencer. 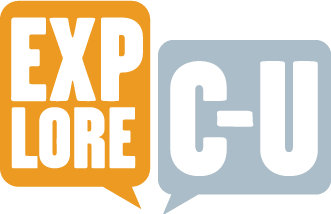 Russo, John, Stephanie Kim, and Teruaki Hara, “Old Inman Hotel,” ExploreCU, accessed April 20, 2019, https://explorecu.org/items/show/315.